1.Bow spring makes for a strong reliable centralizer. 4.Suited for vertical and deviated applications. 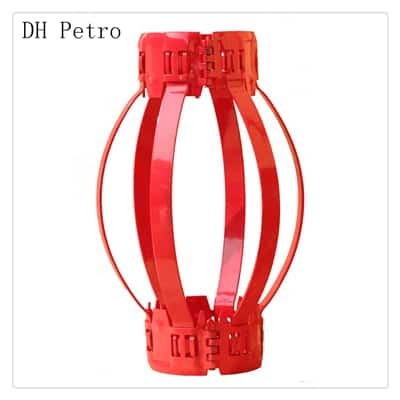 1.Hinged non welded bow spring casing centralizer is a simple, low-cost bow-spring design which can provide complete centralization in vertical or slightly deviated wells as the bow springs are slightly larger than the wellbore. 2. High restoring force combined with low starting force is achieved with all bow heights. 3. The Bows of these Centralizers are heat treated in special furnace which gives it a peculiar ‘bow spring’ action. 6. The bows are available in a range to accommodate any well profile. 8. This enables them to be assembled at site. 9.The Hinged non welded bow spring centralizers are available in size 4-1/2″ to 20″.